COLE-PARMER offers three new high-speed multitube holders as accessories for its original Vortex-Genie 2 and Vortex-Genie pulse mixers. The new tube holders are optimised to achieve the highest vortex action when mixing only a small number of tubes. The Vortex-Genie 2 multi-tube holders are available for tube sizes 50ml, 15ml, or microtubes. The tubes are securely fastened and achieve true vortex action in each tube. 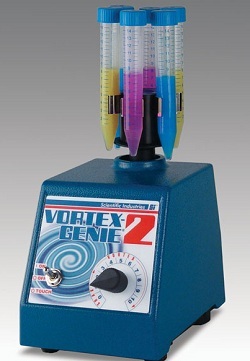 Vortex-Genie2 Shaker boasts a broad range of attachments of various shapes, sizes, and materials allowing for mixing of almost all common tubes or containers for hands-free or touch operation. Its variable-speed control allows slow-speed shaking up to high-speed vortex action. In addition, each attachment is designed to produce different mixing actions, allowing users to choose the correct action for each application. A tough metal housing provides a stable platform for all types of mixing.